Charles Wiley enjoys a career that spans more than 35 years. During this time, Wiley has earned national acclaim for his innovative cuisine and natural presentations. His signature cooking style takes advantage of local, seasonal ingredients, and time-honored flavor marriages; dishes which tend to be light, yet intensely flavored and robust. As executive chef for Hotel Valley Ho, Wiley is responsible for the day-to-day development and operation of dining venues, which include the hotel’s signature restaurant, ZuZu. Wiley held the position of executive chef at Deer Valley Ski Resort and The Stein Eriksen Lodge in Park City, Utah. He then went to The Boulders Resort in Carefree, Arizona, where he directed the cuisine for ten years as executive chef and director of food and beverage. While at The Boulders, he was awarded a scholarship to The School for American Chefs under the direction of Madeline Kamman. In 2001, he opened Sanctuary on Camelback Mountain as executive chef and director of food and beverage, where he was instrumental in the concept, menu design, and cuisine for all dining outlets, including elements restaurant. Wiley remains involved in Sanctuary’s operations as culinary director for Westroc Hotels & Resorts. Chef Wiley has received numerous culinary honors. He was named one of “The Ten Best New Chefs in America” by Food & Wine magazine, and the James Beard Foundation recognized him as “One of the Best Hotel Chefs of America”. It invited him on four occasions to cook at The James Beard House in New York, and in 1998, he was invited to prepare the entrée for The James Beard Journalism Awards Dinner. 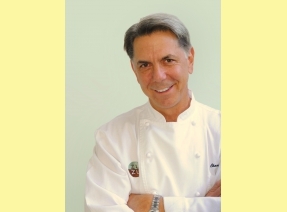 Additionally, in 2000, he was inducted into the Scottsdale Hall of Fame as Chef Honoree. Wiley has been featured in PBS’ “Savor the Southwest” with host Barbara Fenzl, and can be seen preparing dishes on “Your Life A to Z” weekly on KTVK Channel 3 in Phoenix. Nationally, he has appeared on NBC’s “Today Show” with Katie Couric, ABC's “Regis & Kelly”, and has been a guest on The Food Network. His cuisine has been featured in numerous food publications including Food & Wine, Bon Appetit, The Wine Spectator, Food Arts, Art Culinaire, Phoenix Home & Garden, Phoenix Magazine, Arizona Foothills, and many others. What Created Your Passion for Cooking? At first I fell in love with the teamwork and camaraderie in a restaurant; the food came later. When I started cooking professionally I was amazed at the diversity of cuisines and techniques. It was the perfect outlet for my creativity, and if you happen to have a bad night, you can start fresh again tomorrow. Besides Cafe ZuZu, where is your favorite place to eat? Fresh, un-fussy food is my thing. I like Sushi-Ko in Scottsdale and Café Bink in Carefree. That’s easy. Nichole’s Pecan Pie at ZuZu. Tell me about your favorite foods and why? Are any of them traditional family favorites? Any fun stories behind your family celebrations. My first recollection of cooking was chopping parsley for the Thanksgiving turkey. It smelled so good I still think back to that day when I chop some now. I love seafood and vegetables, although neither were a part of my diet growing up. My grandmother lived in a little mining town in Pennsylvania where a lot of Russian immigrants lived. They had a big festival in the summer and all the babushkas cooked their specialties under tents. When I was about 8 I bought a pirozhki for a nickel and I swore it was the best thing I ever ate in my life. Good thing I only had a pocketful of change because I ate pirozhki until I ran out of money, then I couldn’t walk. I had to lay down in the grass for a couple of hours. It was worth it. Willing to share any insights as to why Café ZuZu has the best short ribs and creamy grits? No earth-shattering, innovative breakthrough here. The ribs are cooked with a lot of love — seared, seasoned and braised slowly with garlic, good wine and aromatics. Then the sauce is reduced to really concentrate the flavors. We sneak a little mascarpone cheese in the grits; that’s what makes them so creamy and dreamy. What ingredients can you not do without when you’re cooking? Salt, freshly ground black pepper (I don’t like the flavor of white pepper), citrus and fruity olive oil. What’s the most basic advice you give when you’re talking to someone about cooking? Set your kitchen up for success, find a recipe that sounds good and practice until you master it. Then move on to the next. Share your thoughts about Arizona agriculture. I love the fact I can pick oranges and grapefruit off a tree when the rest of the country is under a blanket of snow. The long growing season gives us a distinct advantage; our produce is always beautiful. Any advice about food and nutrition? I follow the adage “everything in moderation”. Whole, seasonal, fresh foods, organic whenever possible. I believe in realistic portion size and using interesting grains and legumes. What is unique to Arizona when it comes to food, restaurants and/or anything related? When I moved here from the San Francisco Bay Area 22 years ago, I was struck by how tightly knit the restaurant community was. We are fortunate to have passionate farmers like Bob McClendon and Pat Duncan who take a tremendous amount of pride in growing and procuring the most delicious fruits and vegetables. Place the zucchini and onion in a large, non-metallic bowl, and sprinkle the salt overtop. Use your hands to evenly mix the salt throughout the zucchini. Cover, and refrigerate overnight. The following day, drain the zucchini in a colander, and rinse well with cool water. Squeeze out excess water and set aside. Place the red and green bell pepper, sugar, vinegar, and cornstarch into a large pot. Add the nutmeg, turmeric, celery seed and pepper. Stir to combine, then add the drained zucchini. Bring to a boil over medium-high heat, then reduce the heat to medium-low, and simmer 30 minutes. Meanwhile, sterilize 7 one-pint jars and lids to hold relish. Pack relish into sterilized jars, making sure there are no spaces or air pockets. Fill jars all the way to top. Screw on lids. Place a rack in the bottom of a large stockpot and fill halfway with boiling water. Carefully lower jars into pot using a holder. Leave a 2 inch space between jars. Pour in more boiling water if necessary, until tops of jars are covered by 2 inches of water. Bring water to a full boil, then cover and process for 30 minutes. Remove jars from pot and place on cloth-covered or wood surface, several inches apart, until cool. Once cool, press top of each lid with finger, ensuring that seal is tight (lid does not move up or down at all).